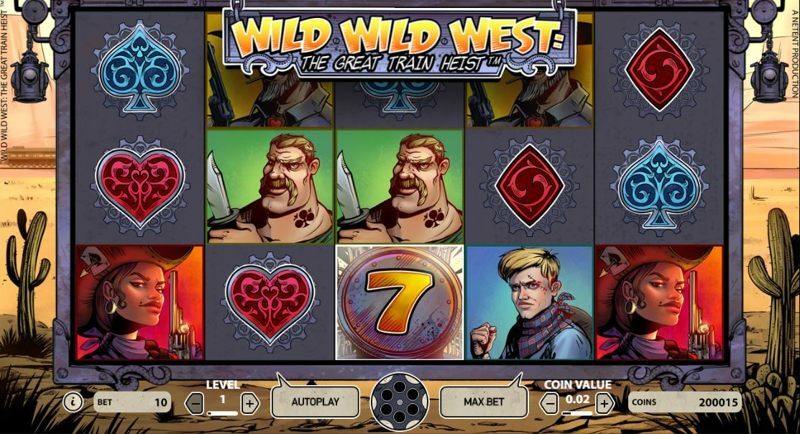 Wild Wild West: The Great Train Heist is a new video slot from Net Entertainment, one of the strongest and more visible players in the casino game development space today, and as the name tends to reveal, this new title is themed around an elaborate theft from a train, that takes place in the Wild Wild West. Wild Wild West: The Great Train Heist uses 5 reels, and 10-pay lines, and like most of Net Entertainment’s new-releases, the payline structure is fixed, meaning you can’t adjust the number you play. Again, in-line with most Net Entertainment games, you’ll find the “Autoplay”, “Max Bet”, and “Settings” Buttons at the bottom of the screen, ensuring regular players will instantly be able to distinguish it’s a Net Entertainment game. The game uses comic-book styled graphics and animations, and while we’ve seen Net Entertainment do this before, notably in the Jack Hammer series, Wild Wild West: The Great Train Heist takes design to a new level. The western-themed soundtrack compliments the game further, and you’ll be entertained both during regular gameplay, and the bonus-rounds, thanks to the vibrant, tense, somewhat wacky music that accompanies the gameplay. The reels use playing card suits as the low-paying symbols (Club, Heart, Spade, and Diamond), and you’ll also see four villains – the female character is the highest-paying, offering 50X for 5-of-a-kind. 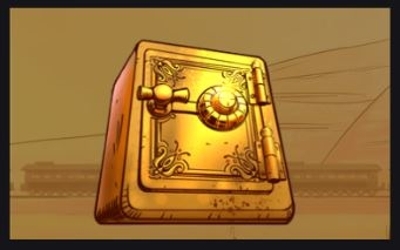 The Pick ‘N Click feature is triggered by landing three of the bonus symbols (safe vaults) on reels 1, 3, and 5, and when you do, you’ll be given the choice to pick one of the three safes. The safe you pick then simply reveals a cash prize, which can range from between 5X, and 50X your total stake. 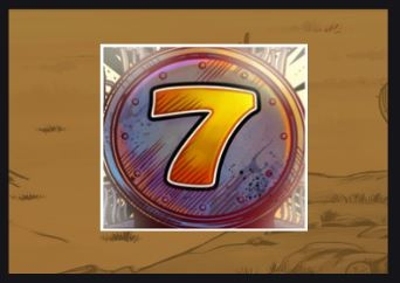 Of course, Net Entertainment use a free-spins round as the main bonus-round in Wild Wild West: The Great Train Heist, and in order to trigger it, you’ll need to land three or more of the scatter symbols (“7’s”) anywhere in view. 3 scatter symbols awards 10 free-spins, while 4 awards 20, and 5, 30. Regular Wild: Nothing special here – if the wheel lands on the regular wild, you’ll simply have an increased chance of landing an overlay wild on reels 1-3. 2X Multiplier Wild: Again, appearing on reels 1-3, the 2X Multiplier Wild does just what it says – it multiplies any wins it contributes towards, by 2X! Spreading Wild: If you get the Spreading Wild, wherever a Wild Symbol lands, that wild will then spread across the first three reels (on the same row it landed on), ensuring at least a 4-of-a-kind win. Expanding Wild: By far the most beneficial of the wild features you can land, the Expanding Wild covers the entire reel it lands on, so it’s possible to get a full three wild reels, ensuring a HUGE win!